Opinion Forum » Is Governor Romney an Edsel Republican? Is Governor Romney an Edsel Republican? Remember the Ford Edsel? A really spiffy new car with a two-tone paint job, lots of chrome and an unfortunate distraction in front? The Edsel in no manner resembles either the Republican party of today or its favored candidate; perish all such heretical conservative thoughts lest you be deemed a Tea Party Terrorist. 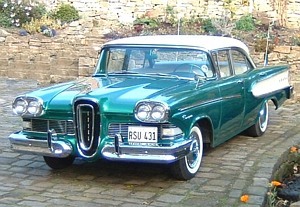 The Edsel was introduced amid considerable publicity on “E Day”—September 4, 1957. It was also promoted by a top-rated television special, The Edsel Show, on October 13, but the promotional effort was not enough to counter the adverse initial public reaction to the car’s styling and conventional build. For months, Ford had been circulating rumors that led people to expect an entirely new kind of car, when in reality, the Edsel shared its engineering and bodywork with other Ford models. 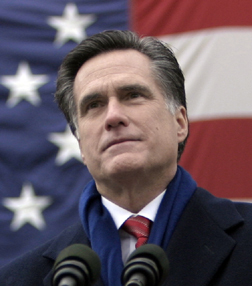 Governor Romney, who (we have been assured, repeatedly) will be the Republican presidential nominee this year, can not realistically even be presented as new, different and more exciting than President Obama. He is just not quite Obama; merely Obama Lite. Perhaps the Edsel would have been better received had its advertisements merely claimed “It’s not a Studebaker.” In all of his mundane glory Governor Romney, like the Edsel, has been offered to a disappointed public hoping for something new, different and better — a big change from the dull and boring cars of the past. Sold only in 1958 (68,045), 1959 (47,396) and 1960 (2,846), the Edsel flopped (I have seen no reports, however, of it having frequently flipped). Governor Romney had the best advertising money could buy in Florida. Have the Republican (as distinguished, if such a distinction is credible, from Governor Romney’s) marketing experts failed to understand consumers or have the foolish consumers failed to understand that what’s best for the party leaders is also best for the rest of us? Have the denizens of the Republican executive offices failed to understand what Republicans want and can vote for with enthusiasm? Not that enthusiasm is important, of course, but still…. Poor workmanship, such as “I’m not concerned about the very poor?” Nah, those were only ill-chosen words spoken in the heat of the Florida victory and besides he didn’t say (again) that he likes to eat fire people. True, as the linked article observes, headlines will take his words out of the context in which they made at least some sense (mainly to those who hope to continue and expand the welfare state, a great post-partisan talking point); however, as a mere Washington outsider and not even a career politician, Governor Romney could not possibly have anticipated that sort of reporting. It’s already happening, all over the place. Couldn’t he at least have claimed that he considered the very poor interesting? In 2007, the Edsel had the honor of being named the twelfth worst car in American history. I remember an old joke about the least lucky person in modern times: a pregnant prostitute driving an Edsel with a Nixon sticker. Is Governor Romney an Edsel? Of course not. He is not an automobile and has not yet claimed to be one. Beyond that, he does not claim to be an exciting new model or even The One® we’ve been waiting for. Moreover, his marketing has been different from that used in the Edsel introduction. The slick marketing campaign built a lot of anticipation around the Edsel’s release by only showing the car through unfocused lenses and thin, gauzy sheets. Buuuut, again, like above, no one knew what the hell the Edsel was supposed to be. Also the name is ugly as sin. There have been no “unfocused lenses and thin, gauzy sheets” to build up excitement for Governor Romney; they have been used only to obfuscate his conflicting positions. While his inconsistencies have blurred what he stands for to the point that no one (maybe not even Governor Romney himself) knows who or what the real Governor Romney is, there has been something for nearly everyone so everyone should be pleased with him. Right? He resembles RomneyCare ObamaCare — we have to pass it elect him to find out what’s in it him, away from the fog of controversy; controversy is terribly confusing and therefore bad and so are those who create it. That may work. We will probably nominate and maybe even elect him. I guess I will vote for him if there is no viable option because he was the choice of my betters. Then, perhaps we will learn, through his actions rather than his words, what’s in him and what’s in store for the rest of us. Some of us may enjoy being caged on top of the Romney Mobile and treated to lots of hot fresh air. It might well be an improvement over the present stuffy but chilly atmosphere in Washington. In any event, the views on top will be breathtaking and Former First Dog Bo may become insanely jealous when President Romney’s dog gets to ride in a crate atop Air Force One. 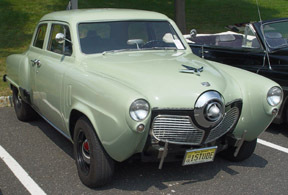 I remember the Edsel very well, and the much maligned Studebaker, too. I guess one has to be of a certain age…. I was a teenager when the Edsel came out. I remember the hype, and then I saw the car up close quite a few times. A girlfriend at the time had one — well, her parents had one — and I drove it now and then. It was odd that the automatic transmission buttons (P,N,D,L,R) were arranged around the center of the steering wheel, but aside from that, it seemed like just another car. My relationship with this particular girl was about as successful as the Edsel itself. Come to think of it, the vertical center grill design, as described by Time magazine but using a less polite word, seems appropriate, in context.